Development of organ dysfunction associated with sepsis is now accepted to be due at least in part to oxidative damage to mitochondria. Under normal circumstances, complex interacting antioxidant defense systems control oxidative stress within mitochondria. However, no studies have yet provided conclusive evidence of the beneficial effect of antioxidant supplementation in patients with sepsis. This may be because the antioxidants are not accumulating in the mitochondria, where they are most needed. Antioxidants can be targeted selectively to mitochondria by several means. 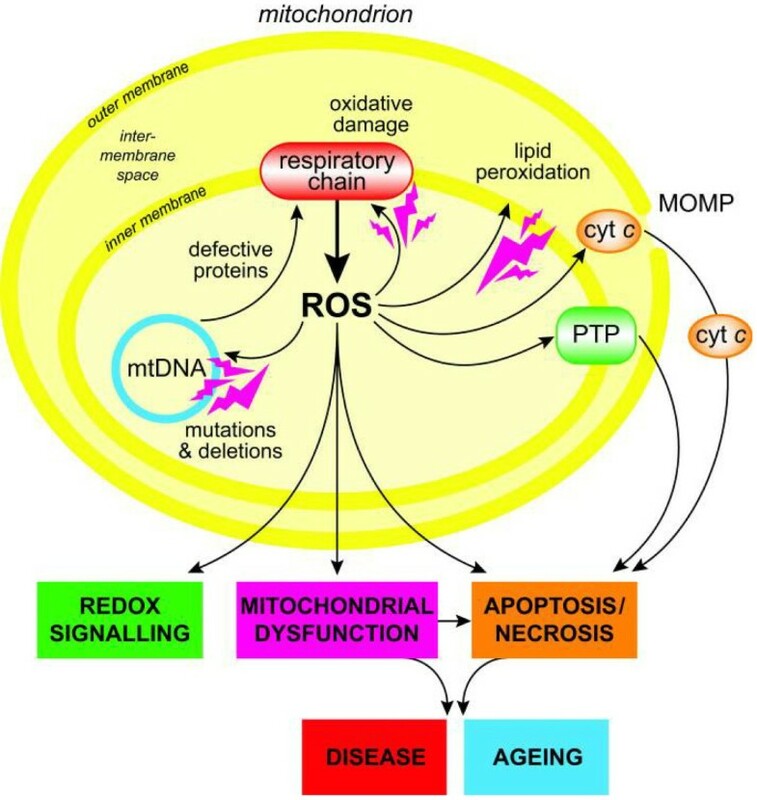 This review describes the in vitro studies and animal models of several diseases involving oxidative stress, including sepsis, in which antioxidants targeted at mitochondria have shown promise, and the future implications for such approaches in patients. Sepsis is a major cause of mortality in intensive care units. Sepsis is a leading cause of death in both developed and underdeveloped countries and the incidence is increasing each year; worldwide, sepsis affects about 18 million people every year . Sepsis has a mortality rate of around 25% for uncomplicated sepsis, rising to 80% in those patients who go on to develop multiple organ failure, so the number of deaths is considerable. The precise pathogenesis of sepsis-induced organ failure is unknown, but changes that result in altered oxidative phosphorylation and ATP production occur in mitochondria. Mitochondria are both the major source of intracellular reactive oxygen species (ROS) in a resting cell and a major target [2, 3]. Mitochondria produce more than 90% of the body's cellular energy in the form of ATP via oxidative phosphorylation. ROS can be generated from complexes I and III of the mitochondrial electron transport chain (ETC), by the tricarboxylic acid (TCA) cycle enzymes aconitase and α-ketoglutarate dehydrogenase, by non-TCA cycle enzymes (including pyruvate dehydrogenase and glycerol-3-phosphate dehydrogenase), and by monoamine oxidases and cytochrome b5 reductase, located in the outer mitochondrial membrane. The inner membrane of the mitochondria has low permeability in order to permit energy conservation in the form of an electron and pH gradient over the membrane. However, mitochondria can undergo a generalized increase of permeability of the inner membrane, called permeability transition. The permeabilization of the membrane is due to the opening of the permeability transition pore, which is an early key event in apoptosis, causing activation of the caspase cascade through release of cytochrome c. The pore transition is sensitive to oxidative stress. An overview of mitochondrial ROS production is presented in Figure 1. Overview of mitochondrial reactive oxygen species (ROS) production. ROS production by mitochondria can lead to oxidative damage to mitochondrial proteins, membranes, and DNA, impairing the ability of mitochondria to synthesize ATP and other essential functions. Mitochondrial oxidative damage can also increase the tendency of mitochondria to release cytochrome c (cyt c) into the cytosol by mitochondrial outer membrane permeabilization (MOMP), leading to apoptosis. Mitochondrial ROS production leads to induction of the mitochondrial permeability transition pore (PTP), which makes the inner membrane permeable to small molecules. Mitochondrial oxidative damage contributes to a wide range of pathologies, and mitochondrial ROS act as a reversible redox signal modulating the activity of a range of cellular functions. Reproduced from  with permission. In addition to producing ROS, the mitochondrial respiratory chain is capable of producing nitric oxide and other reactive nitrogen species (RNS), including (notably) peroxynitrite formed from the reaction of nitric oxide with superoxide anion. RNS can oxidize proteins and nucleic acids and cause nitrozation or nitration of cellular targets, including proteins and glutathione. Three isozymes of nitric oxide synthase (NOS) catalyze the production of nitric oxide from L-arginine in the presence of NAD(P)H and oxygen, although the oxygen concentration threshold below which this pathway does function is unclear. The existence of a mitochondrial form of NOS was proposed [4, 5] but this remains controversial . It has also been suggested that the respiratory chain can reduce nitrite to nitric oxide and that this pathway is oxygen-independent and is activated by hypoxia . However, this review will concentrate on mitochondrial ROS and antioxidant protection. Mitochondria have other important roles in both physiological and pathophysiological processes, including calcium homeostasis, cell signaling pathways, transcriptional regulation, and apoptosis [7–9]. Thus, mitochondrial ROS are important for normal cellular function and survival, and a complex but tightly controlled scavenging system allows these functions while limiting damage. In normal healthy cells, oxidation and the generation of ROS occur at a controlled rate, but under high stress conditions or in disease states (including sepsis), ROS production is increased, causing changes to proteins and lipids. Under normal conditions, mitochondria are protected from damage by ROS via several interacting antioxidant systems, but when antioxidant protection is overwhelmed, oxidative stress initiates damage to nucleic acids, proteins, and lipids in mitochondria, resulting in loss of enzyme function in the ETC and eventually leading to mitochondrial dysfunction and impairment of ATP production [3, 10]. Endogenous antioxidant systems can also be damaged via protein oxidation, and peroxidation of cardiolipin leads to the dissociation of cytochrome c ( compromising the function of cytochrome c oxidase), reduced ATP production, and further increased generation of ROS [3, 9, 10]. A complex network of well-defined and tightly regulated antioxidant defense systems is present in mitochondria and acts at several levels. These systems use both enzymatic and non-enzyme path-ways to scavenge mitochondrial ROS and include manganese-containing superoxide dismutase (MnSOD), the glutathione and thioredoxin systems, peroxyredoxins, sulfiredoxins, cytochrome c, peroxidase, and catalase [11, 12]. An increase in ROS production can also occur as a consequence of depletion or a defect in the mitochondrial antioxidant system. Increased ROS production under such conditions has been ascribed to a self-regenerating ROS production facilitated by ROS-induced ROS release. This increase in oxidative stress results in further damage of mitochondrial proteins that are highly sensitive to oxidative stress. A point is reached at which the scavenging systems are completely overwhelmed, leading to a state of so-called 'toxic oxidative stress' . Oxidative stress occurs when the balance between production of ROS and antioxidant protection is disrupted, leading to the activation of pathways that affect cell differentiation and apoptosis. Oxidative stress has been reported over the last decade in patients with sepsis , as shown by increased levels of lipid peroxides and direct detection of circulating radicals [15–17], decreased antioxidant capacity associated with non-survival [18, 19], decreased concentrations of individual antioxidants [15, 20, 21], detectable circulating redox-reactive iron , ischemia-reperfusion leading to xanthine oxidase activation , and abnormal handling of exogenous antioxidants . Oxidative stress initiates inflammatory responses and cell activation, and elevated activation of the redox-sensitive transcription factor nuclear factor-kappa-B (NF-κB) in patients with sepsis has been described [24–26]. It is not certain whether mitochondrial dysfunction is the primary event that leads to oxidative stress and further mitochondrial damage or, conversely, whether oxidative stress contributes to mitochondrial dysfunction. What is known is that a self-sustaining and self-amplifying feed-forward cycle between ROS generation and mitochondrial impairment occurs. Oxidative stress has been reported consistently in patients with sepsis, and mitochondrial dysfunction as a result of oxidative stress has been suggested as a causative factor in the development of organ failure in sepsis [27, 28]. Mitochondrial dysfunction has been described in rat models of sepsis , and a study in baboons treated with live Escherichia coli found decreased complex I/II activities in heart mitochondria . In cats, deranged mitochondrial ultrastructure and impaired respiratory activity were observed 4 hours after lipopolysaccharide (LPS) (endotoxin) administration , and in livers from patients who had died of severe sepsis, hypertrophic mitochondria with reduced complex I and IV activity were observed . Deranged mitochondrial redox state  and an association between antioxidant depletion and mitochondrial dysfunction related to organ failure and eventual outcome have been reported in patients with sepsis . Since oxidative damage to mitochondria is central to the pathology of sepsis, antioxidants could be potential therapies. However, no studies have yet provided conclusive evidence of the beneficial effect of antioxidant supplementation in critically ill patients [14, 35]. This may be because the antioxidants are distributing throughout the body and are not accumulating in the mitochondria, where they are most needed. Antioxidants targeted specifically at mitochondria have therefore been proposed. The desired effect of a drug or gene targeted at mitochondria in organs can be achieved only if the bioactive molecule is taken up by the required organ or cell type or both and accumulates in the desired sub-cellular location (in this case, mitochondria). The specificity of distribution and penetration in organs and consistent delivery and activity in mitochondria are paramount. Antioxidants have been targeted selectively to mitochondria by several means and have been shown to be effective at reducing mitochondrial damage and apoptosis in vitro and in animal models of several diseases involving oxidative stress. Strategies to reduce the mitochondrial damage caused by sustained oxidative stress as a therapeutic approach include augmenting ROS scavenging by antioxidants that (a) are delivered specifically to mitochondria, (b) act where needed in the mitochondria, or (c) pharmacologically or genetically increase endogenous expression of mitochondrial antioxidant systems. One approach is to target antioxidants selectively to mitochondria by conjugating an antioxidant to lipophilic cations that accumulate within mitochondria, driven by the mitochondrial membrane potential. For example, MitoQ consists of the lipophilic triphenylphosphonium (TPP) cation attached to the ubiquinone antioxidant moiety of the endogenous antioxidant co-enzyme Q10 . The lipophilic TPP cation enables MitoQ to be taken up rapidly through the plasma and mitochondrial membranes without the requirement for a carrier, and the large membrane potential (negative inside) across the mitochondrial inner membrane causes MitoQ to accumulate several hundred-fold within mitochondria [36–38]. Within mitochondria, the MitoQ adsorbs to the matrix surface of the inner membrane and is recycled to the active ubiquinol antioxidant by the respiratory chain (Figure 2). If an antioxidant is attached to triphenylphosphonium, it accumulates several hundred-fold within mitochondria in cells and selectively blocks mitochondrial oxidative damage and mitochondrial redox signaling. Targeted antioxidants include derivatives of the endogenous antioxidants ubiquinol (MitoQ) and α-tocopherol (MitoVitE). Antioxidants that accumulate within the matrix provide better protection from oxidative injury than un-targeted antioxidants. MitoQ has been shown to protect cells from apoptosis and inhibits hydrogen peroxide-induced growth factor receptor signaling [36–40]. It also prevented cell death induced by hydrophobic bile acids, via effects on nitric oxide synthesis, in an in vitro study of hepatocytes . It has been tested in a number of animal models of disease: feeding MitoQ to rats decreased heart dysfunction, cell death, and mitochondrial damage upon subsequent ischemia-reperfusion in isolated hearts , protected endothelial cell function and damage to mitochondrial enzymes in a rat model of oxidative stress , and prevented mitochondrial dysfunction in a rat model of nitroglycerin tolerance . In addition, MitoQ has been developed as a pharmaceutical for oral use in humans , and in phase II trials, it has shown protection against liver damage in patients with hepatitis C virus . MitoVitE is a TPP-conjugated form of tocopherol (vitamin E). Like MitoQ, MitoVitE protects mitochondria and whole cells from oxidative stress induced by several processes, inhibiting lipid peroxidation; blocking apoptosis; inhibiting cytochrome c release, caspase-3 activation, DNA fragmentation, inactivation of complex I and aconitase, and overexpression of transferrin receptor; and restoring mitochondrial membrane potential and proteo-somal activity [36, 38, 40]. MitoVitE has been shown to be many times more effective than the non-targeted water-soluble vitamin E analog, Trolox (F. Homann-La Roche Ltd., Basel, Switzerland). Other compounds have been conjugated to TPP. For example, ebselen, a selenium-containing compound with peroxidase activity, has been conjugated to TPP to form MitoPeroxidase. MitoPeroxidase was only slightly more effective than ebselen in preventing oxidative damage to mitochondria in contrast to the other TPP-based antioxidants MitoQ and MitoVitE . This is because most of the MitoPeroxidase is conjugated to thiols and this prevents its accumulation in mitochondria to the same degree as MitoQ and MitoVitE. Other investigators have favored conjugating plastoquinone, a plant quinone needed for photosynthesis, to TPP to form a molecule named SkQ. Th is has been shown to protect cells against oxidative stress in vitro and against ischemia-reperfusion-mediated cardiac dysfunction in rats (reviewed in ). Another strategy used the stable nitroxide radical TEMPOL (4-hydroxy-2,2,6,6,-tetramethyl piperidine-1-oxyl), which accepts an electron to form the radical scavenger hydroxylamine. TEMPOL is also able to dismute superoxide anion catalytically and has a catalase-like action that limits hydroxyl radical formation from hydrogen peroxide. By conjugating TEMPOL to fragments of the antibiotic, gramicidin-S, which has a high affinity for mitochondrial membranes, the compound can be targeted to mitochondria . Such conjugates were shown to localize into mitochondria, inhibit superoxide release, and prevent apoptosis in cells. In an animal model of hemorrhagic shock, hemigramicidin-TEMPOL was more effective than non-targeted TEMPOL in preventing gut hyperpermeability in exteriorized ileum, decreasing cardiolipin peroxidation and caspase activation . Administration of hemigramicidin-TEMPOL to rats during hemorrhage decreased mortality rate compared with control animals . Use has also been made of antioxidant peptides containing specific amino acid sequences that allow penetration into cells and concentration in mitochondria. These molecules were designed by HH Szeto and PW Schiller and so were named SS peptides. They are small synthetic peptides (fewer than 10 amino acids) with basic amino acid residues providing positive charges at physiological pH. They are stable in aqueous solution, resist peptidase degradation, and freely penetrate by passive diffusion into a variety of cell types, and mitochondrial uptake is estimated to be 1,000- to 5,000-fold compared with extra-mitochondrial concentration . The mechanism behind the selective targeting of the peptides to the mitochondrial inner membrane is not understood. The inner mitochondrial membrane is unique in its high density of cardiolipin, and the selective partitioning may be a result of electrostatic interaction between these cationic peptides and anionic cardiolipin. Some of the SS peptides have antioxidant properties and can dose-dependently scavenge hydrogen peroxide, hydroxyl radical, and peroxynitrite and limit lipid peroxidation (Figure 3). The potentially independent mitochondrial uptake of these peptides may be an advantage when dealing with diseased mitochondria with reduced mitochondrial potential. There have been no studies of these agents in models of sepsis. In vitro assays showing antioxidant properties of SS* peptides. (a) SS-02 dose-dependently scavenges hydrogen peroxide as measured by luminol chemiluminescence. (b) SS-02 dose-dependently inhibits linoleic acid peroxidation. Linoleic acid peroxidation was induced by 2,2'-azobis(2-amidinopropane) and detected by the formation of conjugated dienes measured by absorbance at 234 nm. (c) SS-02 dose-dependently inhibits low-density lipoprotein (LDL) oxidation. Human LDL was oxidized by 10 μM copper sulphate, and the formation of conjugated dienes was monitored at 234 nm. (d) Comparison of different SS peptides (100 μM) in slowing the rate of linoleic acid oxidation. (e) Comparison of different SS peptides (100 μM) in slowing the rate of LDL oxidation. B, basal rate. Reproduced from  with permission. *So named after HH Szeto and PW Schiller. Redox homeostasis in mitochondria is regulated by various antioxidant mechanisms, including glutathione, thioredoxin, and peroxiredoxins. Glutathione is the most abundant non-protein thiol in cells and plays an important role in antioxidant defense mechanisms. Mitochondria cannot synthesize glutathione so it is synthesized in the cytoplasm and transported into the mitochondria by dicarboxylate and 2-oxoglutarate carriers. Choline esters of glutathione N-acetyl-l-cysteine are hydrophilic antioxidants that concentrate in mitochondria and increase available glutathione. These compounds reduce oxidative stress-induced mitochondrial depolarization in isolated mitochondria and intact myocytes and neurones in vitro , but there are no studies in models of sepsis. Other techniques to increase endogenous antioxidant protection include genetic approaches, such as adenoviral transfection with MnSOD. In both alcohol and ischemia-reperfusion-induced oxidative stress in rats, adenoviral transfection of the human MnSOD gene resulted in upregulation of MnSOD activity in liver, with reduced hepatic oxidative damage [54, 55]. Non-protein mitochondrial superoxide dismutase mimetics have been developed to allow uptake into the mitochondrion to scavenge ROS. The mitochondrial MnSOD mimetics MnTBAP and Mn(III) meso-tetrakis (N-methylpryidinium-2-yl) porphyrin (MnTE-2-Py5+) accumulate in heart mitochondria following intraperitoneal injection in animals and reduced mitochondrial ROS production in an ischemia-reperfusion model . Melatonin (N-acteyl-5-methoxytryptamine) is synthesized in several organs, with higher levels in mitochondria, and is both lipophilic and hydrophilic. It has been identified as having anti-inflammatory and antioxidant activity, scavenging hydrogen peroxide and augmenting endogenous antioxidant pathways and downregulating mitochondrial nitric oxide production. Melatonin has been shown to prevent mitochondrial dysfunction, energy failure, and apoptosis and decreased inflammatory cytokine release in oxidative stress-exposed mitochondria . α-Lipoic acid is a disulphide derivative of octanoic acid with antioxidant activity. It is taken up and reduced within mitochondria to dihydrolipoate, an antioxidant more powerful than lipoic acid. Lipoic acid inhibits nuclear translocation of NF-κB, and numerous studies have shown beneficial effects in oxidative stress-induced pathological processes . Recently, Ripcke and colleagues  developed a lipoic acid derivative containing a cleavable TPP tag that is endogenously cleaved by mitochondrial aldehyde dehydrogenase (ALDH-2) after mitochondrial accumulation, thus liberating active compound (in this case, lipoic acid) and reducing oxidative stress in vitro. Another study exploited the β-oxidation pathway within mitochondria to deliver and biotransform pro-drugs to their corresponding phenolic or thiol antioxidants . Biotransformation to methimazole and several phenolic antioxidants was shown to protect isolated cardiomyocytes against hypoxia-reoxygenation injury, leading the authors to conclude that mitochondrial β-oxidation may be a useful delivery system for targeting antioxidants to mitochondria. However, the rates of biotransformation varied depending on the number and position of methyl groups on the pro-drug. In addition, loss of membrane potential resulted in loss of bio-transformation, and this may suggest that this targeting approach may be less useful in the presence of pathological mitochondrial dysfunction. There is a large body of evidence showing that oxidative stress-induced mitochondrial dysfunction plays a role in sepsis-mediated organ damage such that antioxidants are likely to be of therapeutic potential in preventing multiple organ failure [27–34]. However, studies of antioxidant administration in critically ill patients with sepsis have not been convincing [14, 35]. Mitochondrial dysfunction and downregulation of genes expressing mitochondrial proteins occur during sepsis, and recovery after sepsis requires the restoration of metabolic processes via production of new functional mitochondria to restore the energy supply. It has been proposed that the protection of mitochondria against oxidative damage may be particularly important in patients with sepsis and this raises the possibility that mitochondria-targeted antioxidants may be of therapeutic benefit in sepsis-induced organ failure. 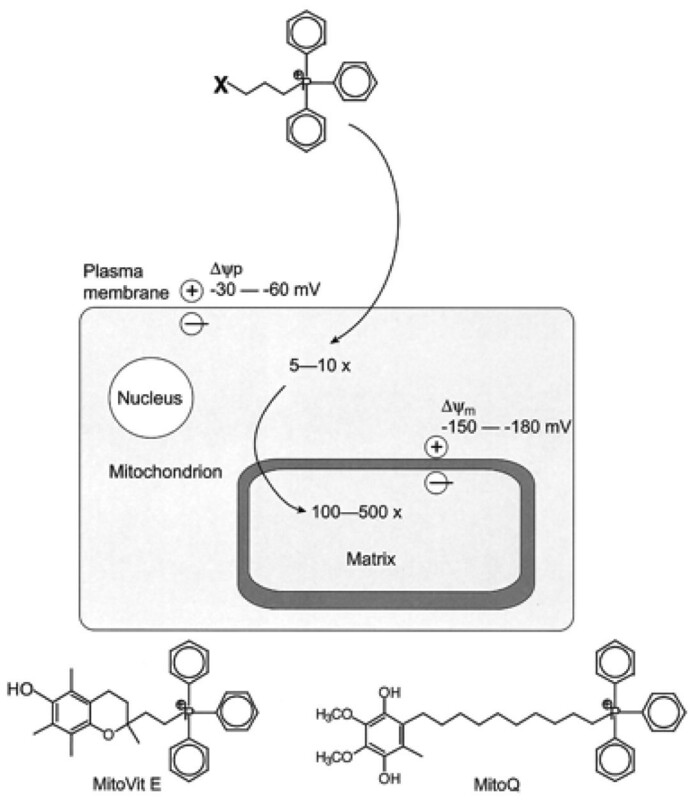 Fink and colleagues  suggested that TPP-conjugated antioxidants would have limited utility in patients with sepsis since the mitochondrial depolarization sometimes seen during sepsis may result in poor uptake of TPP-conjugated antioxidants into mitochondria and increasing the dose may cause membrane depolarization through accumulation of the cation. Despite this, MitoQ is the most studied of the mitochondria-targeted anti-oxidants. MitoQ has been shown to have antioxidant and anti-inflammatory effects under conditions of sepsis; in an in vitro study in which human endothelial cells were treated with MitoQ under conditions of simulated sepsis, the rate of ROS formation was decreased and mitochondrial membrane potential was maintained . In addition, both MitoQ and MitoVitE have been shown to result in decreased LPS-induced cytokine release in vitro [61, 62]. 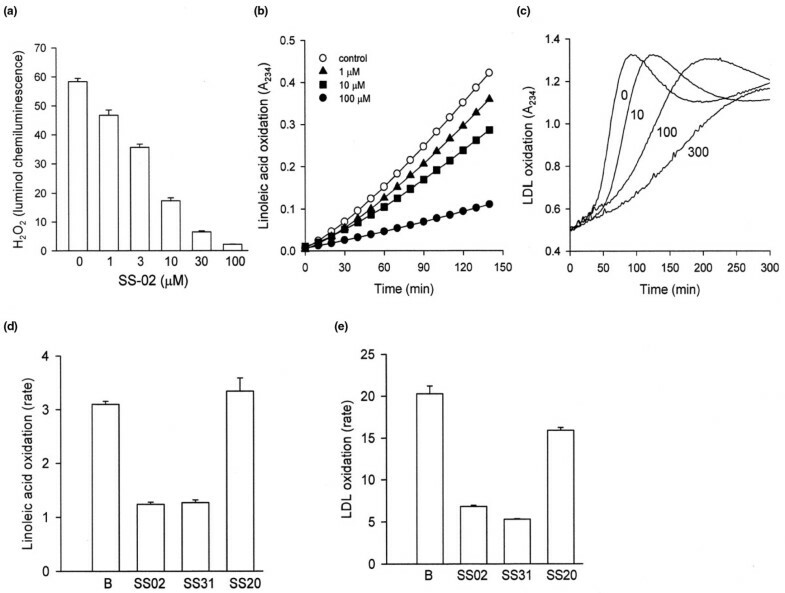 In animals, oral, intraperitoneal, or intravenous administration of MitoQ or MitoVitE results in rapid accumulation in mitochondria of key organs in rats and mice; furthermore, biochemical evidence of liver and renal dysfunction was decreased in a rat model of acute sepsis-induced organ dysfunction when rats were given an intravenous infusion of MitoQ immediately after initiation of sepsis  (Figure 4). In another recent study, MitoQ administration at the same time as endotoxin also prevented sepsis-induced cardiac dys-function in septic rats and mice . Plasma creatinine concentrations (a) and plasma alanine amino transferase (ALT) activity (b) in untreated rats and rats treated with lipopolysaccharide (LPS) plus peptidoglycan G (PepG) with triphenylphosphonium control or MitoQ. Results from individual rats are shown. P values are Mann-Whitney U tests with Bonferroni correction. Reproduced from  with permission. Other targeted antioxidants have been tried in models of sepsis. Hemigramicidin-TEMPOL was shown to have anti-inflammatory effects in endotoxin-exposed murine macrophages in vitro, and in endotoxin-exposed mice, pre-treatment with hemigramicidin-TEMPOL decreased NOS expression . Although neither melatonin nor lipoic acid is targeted at mitochondria, both of these compounds are protective against sepsis-mediated mitochondrial dysfunction in animals. Acuña-Castroviejo and colleagues [64, 65] have undertaken studies using several doses of melatonin treatment beginning before cecal ligation and puncture in mice, showing attenuated mitochondrial dysfunction. 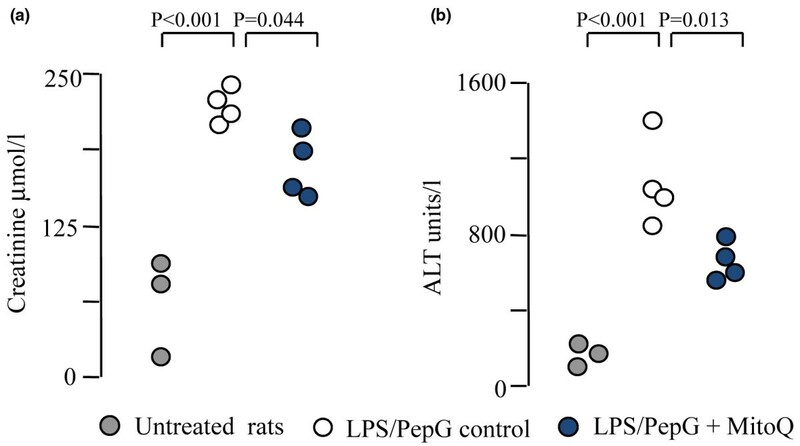 Likewise, in an LPS model of sepsis in rats pre-treated with lipoic acid, oxidative stress was decreased and mitochondrial dysfunction was abrogated . Some aspects of these studies are worth pointing out. In the studies using hemigramicidin-TEMPOL, melatonin, or lipoic acid, treatments were given before the initiation of sepsis [50, 64–66]. Although prevention may be better than cure, pre-treatment is unlikely to be clinically relevant and studies in which treatment is delayed until after the onset of sepsis are more likely to represent what is practical in patients. The ability to use animal studies to predict which patients and which dosing regimens are likely to be of most benefit is a challenge. There are both limitations and advantages to animal models  and these should continue to be refined in attempts to more accurately reproduce human sepsis to maximize clinical relevance [68, 69]. Despite the fact that all modeling approaches face limitations concerning transferability and predictability, there is scientific validity in animal experiments , but scientists and clinicians need to critically evaluate all stages. Sepsis has a mortality rate of around 25% for un-complicated sepsis, rising to 80% in those patients who go on to develop multiple organ failure, so the number of deaths is considerable. Treatment is currently restricted to mainly supportive and reactive treatments, and any novel therapy that reduces the incidence and impact of organ failure would have immense benefit. The notion that mitochondria-targeted antioxidants may be of benefit in sepsis is appealing. There is promise in the early data but there is still a long way to go. At present, the choice of targeting strategies is still open to debate, but increasing the antioxidant defenses of mitochondria under conditions of sepsis has been shown to be, in theory, a viable strategy. Therefore, the scene is set for further studies with the ultimate aim of using this treatment approach in patients. The research work of HFG is funded by the National Institute of Academic Anaesthesia, the UK Intensive Care Society, and the Medical Research Council. HFG has received gifts of MitoQ and MitoVitE from Antipodean Pharmaceuticals, Inc. (Auckland, New Zealand) for use in research studies.